Amy Kazda knows the value of exercises with a calming effect. Kazda, who teaches music at two elementary schools in Madison, WI, said that many of her students come to her classroom directly from gym class. Often, they still have adrenaline pumping through their veins. 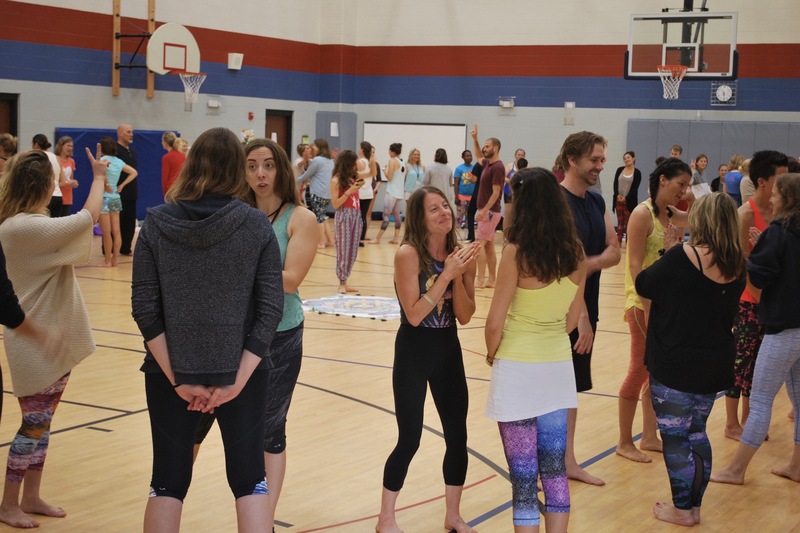 Kazda, who has been doing yoga for the past 15 years, said she found that starting and ending her classes with a “mindful minute”—leading students through breathing exercises, simple yoga poses, and other creative movements—helped improve their focus. “I think it’s really crucial for children in this busy, chaotic world to take that time, and have some calm and quiet,” she said. Kazda is currently working to bolster her mindfulness credentials even further. She’s one of 100-plus participants in an intensive wellness and yoga teacher training program organized by the Madison-based startup Breathe For Change. The program kicked off earlier this week and runs through July 12. Those who complete all requirements will be certified as Registered Yoga Teachers, said Ilana Nankin, founder and CEO of Breathe For Change. Many organizations offer yoga instructor certifications, but Breathe For Change is unique in that it caters specifically to educators, she said. Launched in 2015, Breathe For Change is growing at a fast clip, said Michael Fenchel, the startup’s president and chief operating officer. It trained more than 200 teachers to become yoga instructors last year, and he expects the company to certify another 700 in 2017. Ilana Nankin, founder and CEO of Breathe For Change. Photo by Jeff Buchanan. So far, Breathe For Change has held training sessions in Madison, New York, and the San Francisco Bay Area. In the next 12 months, it plans to expand into new markets, including Los Angeles, Washington, D.C., and Austin, TX. The organization receives about 75 applications a week from teachers seeking to participate in future programs, Fenchel said. “Our biggest challenge is just scaling fast enough,” said Fenchel, who has helped start several ventures, including the Madison co-working space 100state. I recently sat in on a Breathe For Change training session held at a school on Madison’s north side. Getting into the gymnasium where it took place required walking around a sea of Birkenstocks and flip-flops. (Once inside, I believe I was the only one in the room wearing shoes.) The floor along the gym’s four walls was lined with smartphones, energy bars, and clear plastic bottles—most filled with water, though some contained more exotic beverages, like kombucha. Out on the hardwood floor, the class’s participants were not aligned in rows and sitting on top of yoga mats, as I had envisioned. Instead, everyone stood in two concentric circles, except Nankin and Fenchel. They were leading the workshop and stood at center court. During the first exercise I observed, students in the inside circle faced outward, and vice versa. Nankin or Fenchel would ask a question—sample: “How do you like others to show you gratitude?”—and students spent a minute or so discussing their answers one-on-one. Then everyone in one circle would rotate clockwise, another question would come, and students would form new pairs.